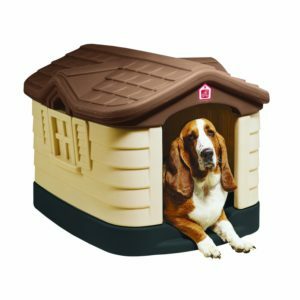 Pet Zone Step 2 Cozy Cottage Dog House has been designed for maximum functionality. In our opinion, functionality is needed, especially when it comes to something like this. This dog house will give your dog the opportunity to get a nice rest and sleep it a cozy and airy interior, unlike some of the other dog houses currently on the market that just aren’t as comfortable as they should be. Regardless of whether you want to have it in the outdoors, or simply inside, it will fit with your interior. You can place it in the corner of the room and it will still look good. Always consider how far or close to your home you want the dog house to be. In our opinion, you should never have your dog too far away from your house, because then it will be hard to keep an eye on him/her. Also, do you have small children? If you do, you need to teach them not to crawl into the dog house. This is because its new owner may not appreciate it and it just isn’t safe to have a child in a dog house (as weird as that may sound). 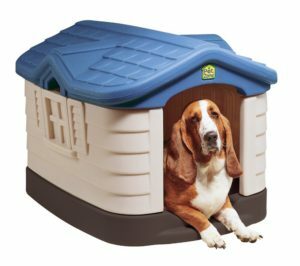 However, your dog will feel comfortable in this all-weather resistant durable plastic dog house. Pet Zone Step 2 Cozy Cottage Dog House offers your pet a comfortable home. Slight peak-roof structure can be lifted off to clean the interior. House is rot, rust, draft and weather-resistant. The interior is spacious and lets in sufficient ventilation. Has a shuttered window on the side and the dog’s name plate above the door. Accommodates medium dogs up to 76 pounds. Made from a UV-protected and waterproof plastic material that is great under any-weather condition. Fits into any corner of your home or outdoors. The manufacturer claims the dog house will fit dogs up to 75 lbs but in our opinion that is too large a dog for this house. If you have a large dog you should look at the Pet Zone Step 2 Tuff-n-Rugged Dog House Review which is a very similar dog house but bigger. The Pet Zone Step 2 Cozy Cottage dog house is insulated and this, as you probably already know, is a major plus. Your dog will be much more protected and comfortable during both the colder winter and hotter summer months in an insulated house. The insulation method used is double-wall construction which provides up to 10x more insulation than single-wall houses. While this house is probably not as well insulated as some others (see our ASL Solutions Dog Palace Insulated Dog House Review and our Petmate Indigo Igloo Dog House Review for the best insulated dog houses) the Cozy Cottage’s double-wall insulation is still much better than a single-wall house and will be fine in moderate climates. Also, the floor is elevated, so the house isn’t sitting right on the ground. There is plenty of ventilation with two vents that can be opened in warmer weather and closed in the cold. How many products have you purchased, only to go home and spend hours trying to put them together? Honestly, having to assemble products is no fun and with this one right here, you are in luck! Easy to assemble with no tools required. Isn’t that sentence like music to your ears? Also, the roof can be removed, which makes it easy to clean the house – that is a major bonus. Overall the Pet Zone Step 2 Cozy Cottage reviews are quite favorable. Customers are satisfied that the dog house looks like it does in the picture. They like the reasonable price and agree that they dog house is indeed waterproof. Some customers go on to mention that their dog loved the house and was comfortable in it. One review mentions an important feature – there are four holes in the bottom of the elevated floor which require tent stakes to be pounded in so that this lightweight and durable dog house stays put during strong winds and such. There are those who express their opinion that since the floor is only slightly elevated this dog house might to better in drier climates because in rainier climates there is a possibility of water seeping into the dog house. You can probably solve that problem by locating the dog house away from areas where water pools. The most important thing is that dogs do like this house and seem comfortable in it so anything else can be fixed or adjusted accordingly. For such a durable and sturdily constructed dog house the price is very reasonable. At the time of writing, free shipping is available through FedEx/UPS. Honestly, the price you pay for this product is well worth it. Removable roof for cleaning of the interior. Has shuttered side window and name plate above door. Can be wiped clean with a wet cloth. Unfortunately, where there are pros, with almost any product on the market, there is going to be cons, even if just a couple. During our research, we noticed one person complaining about the roof. The individual was complaining that the roof was hard to remove for cleaning because it snapped on too tightly. However, in our opinion, this isn’t that big of a deal. We believe having a roof that snaps on too tightly is better than having one that is too loose. Another reviewer complained about the elevated floors. They stated that there are four large holes for tent stakes. Those four large holes lets water seep in during heavy rain. This can be a problem, especially if your dog is using it to stay dry outside. However, you can avoid that problem by positioning the dog house where water will not rise up and flood. The Pet Zone Step 2 Cozy Cottage dog house might not be one of the fanciest but it is durable and weather-resistant. That is most important if you are going to place the dog house outdoors. Since it can fit in any corner of the house owners can also place this dog house on a porch or patio for more protection for the dog from the elements. It even looks great indoors, and can act as your pet’s own private cozy mini-home. 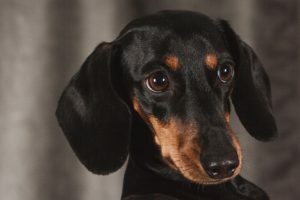 Since the house has sufficient ventilation and plenty of insulation it is a sure bet that the dog will be happy and comfortable in their new home. Even cat owners have noticed that this is one Cozy Cottage that even they prefer. So it is also a very versatile type of dog house and well worth the purchase for a small pet. If you have a large dog you should look at the Pet Zone Step 2 Tuff-n-Rugged Dog House Review which is a very similar dog house but bigger, or read one of our other dog house reviews. Click below to check the Pet Zone Step 2 Cozy Cottage Dog House price.